Join the Health 2000 rewards programme at your nearest store or during the checkout process online. If the email address you sign in with online matches the one assigned to your rewards account, your accounts will automatically connect and there's nothing further you have to do. 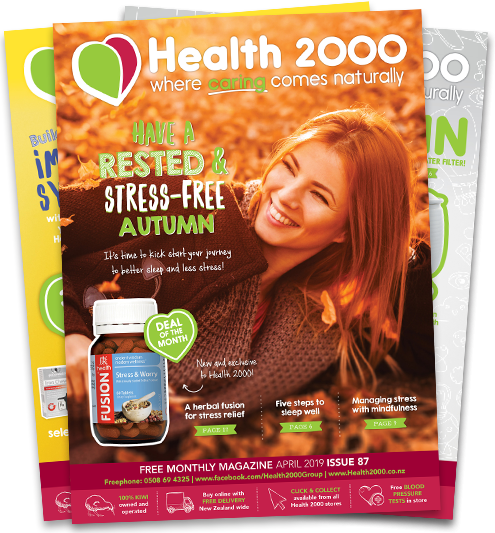 If you experience any issues or have any questions, contact us at info@health2000.co.nz. Every dollar you spend gets you one point. Points are rounded to the nearest dollar. To collect points in store, provide our team with your rewards card or details so they can find you in our system. Online, you will automatically receive the points if your online and rewards accounts are connected. Otherwise, you can enter your card number at the checkout stage, or email info@health2000.co.nz with your order number and card number to add the points later. When you accumulate 75 points, $5 is deducted from your next purchase. You can also choose to save it for another time.